In the car rental area of the booth, Ficosa exhibits the most innovative connectivity solutions of the industry. All assistants who visit this space will find a car in which Ficosa has integrated its latest developments, will discover the company’s work on connected and autonomous vehicles, and see live one of its star products, the Smart Connectivity Module (SCM). 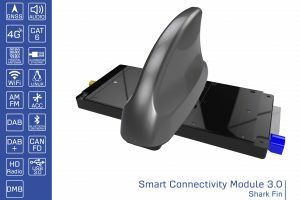 Ficosa presents the third generation of the Smart Connectivity Module (SCM) at the MWC, a solution that turns the car into a self-connective device providing all passengers with simultaneous and independent connectivity. Javier Pujol, CEO of Ficosa, highlights: “The Smart Connectivity Module completely revolutionizes the in-vehicle experience, improving driving, increasing safety and efficiency, and giving users an unprecedented range of services and smart applications”. And adds: “It is a great step towards the driverless car, integrating the vehicle into the communication networks as a device of the Internet of Things”. Ficosa is intensely working to be at the forefront of vehicle connectivity development and 5G technology. An example of this is that it has recently become the first Spanish company to join the 5G Automotive Association (5GAA). The mission of this association is to accelerate development, standardisation and marketing of solutions for connected cars and autonomous vehicles and their integration into Smart Cities, as well as laying the groundwork for implementing 5G technology in the automotive sector. Joan Palacin, Advanced Communications Business Unit director, notes: “The development and implementation of 5G technology will be a new revolution in the telecommunications and automotive sector, as it will offer higher capacity connections and will boost solutions and services based on virtual reality and artificial intelligence. In Ficosa, we always look to the future and new technologies, collaborating with the main ecosystem companies in the definition of the new services of mobility and autonomous driving”. Ficosa’s alliance with Panasonic, which responds to the goal of both companies of increasing their technological capabilities and integrating complementary technologies, offers a great potential for them to lead together the transformation of the automobile in the field of connectivity. In that sense, Ficosa’s units, together with Panasonic’s information and entertainment systems, will provide the user a wide range of new services with high added value.